Photograph from the Curzon Collection: 'Presented with feelings of friendship and sincere admiration to Lord Curzon of Kedleston, Viceroy and Governor-General of India, by H.H. Rasulkhanji, Navab Junagadha. 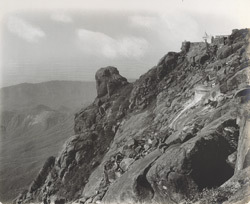 1900', of the Bhairava Japa at Girnar in Gujarat, taken by a photographer of the Solankee Studio around 1900. The Girnar muntain in Gujarat rises more than 900 metres above the plain and is particularly sacred to the Jains. It was an important pilgrimage centre since the 3rd century BC as indicated by the inscriptions on a boulder with the edicts of the emperor Ashoka and the proclamations of a Kshatrapa and a Gupta ruler. Along the principal path that leads to the central peak there are gateways, shrines and tanks and the principal group consist of 16 Jain sanctuaries dedicated to Neminatha. These temples date from the Solanki period and later. In the 'Report on the Antiquities of Kathiawad and Kachh of 1874-75', Burgess wrote, "On the verge of the hill, at some distance to the north of the Jain temples, and above them, stands a huge isolated rock, the Bhairava-jap, or "Leap of Death", otherwise styled the Raja-melavana-pathar - the "desire-realizing rock", - whence poor wretches have often been tempted by demoniac superstition to throw themselves away in the sadly deceitful hope of a happy future."